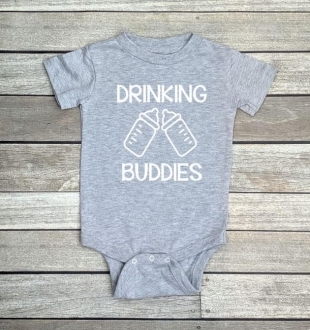 TWIN SET "Drinking Buddies" adorable heathered grey onesies are a 2 piece set! Offered in Newborn and 6 months size. Made of 100% cotton. It has a metal snap button closure for quick diaper changes. Machine washable. **Makes for excellent photo opportunity in Table for Two. Cheers!